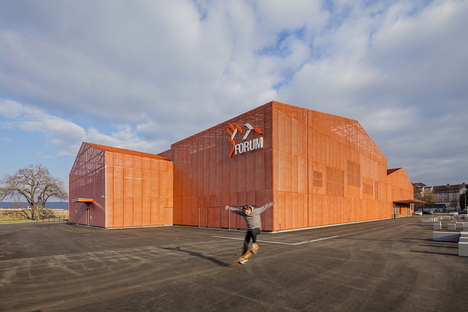 Manuelle Gautrand designed a new Forum for sports, festivals and performances in Saint-Louis, Alsace. In the architecture of the Forum, Manuelle Gautrand was inspired by the urban planning of Saint-Louis, with its low houses alternating with dense housing blocks. Manuelle Gautrand Architecture designed the new Forum for sports, entertainment and festivals that is about to open in the centre of in Saint-Louis. Saint-Louis is the archetype of a borderland, in a region straddling three borders - France, Germany and Switzerland. The city centre, made up of homes and public buildings of modest height, has over the years been surrounded by intensive housing blocks devoid of quality, like so many in the history of the French suburbs. Manuelle Gautrand reinterprets this alternation of tiny volumes and bigger buildings towering over them, industrial buildings from the last century and smokestacks recalling the century before it. The Forum is a volume which is both fragmented and compact, made up of parts of different heights, corresponding to different zones in the internal layout, with a monolithic appearance thanks to the copper-coloured expanded metal plate covering wrapping around it completely, like an iconic protective mantle. The Saint-Louis Forum is a complex project in which every detail was carefully planned on the basis of the construction’s relationship with its surroundings, with results that are innovative in terms of both content and symbolism. The internal spatial programme includes spaces on different scales, from the small scale of the reception area, offices and dressing rooms to the very large scale of the two central performance halls. These, the Salle des Fêtes and the Grand Hall, are directly connected for events requiring direct circulation and also connected through the entrance foyer, a medium-sized space which may lead into both halls at the same time or to only one of the two. To obtain this layout, all accessory spaces were allocated around the perimeter of the main halls, connected to the entrance only indirectly. This layout corresponds to that of the roof, designed by organising a series of gabled roofs, corresponding to the 13 large and small rooms in the floor plan: oriented in alternative directions, they are inspired by the varied, fragmented landscape of a bird’s eye view over the city of Saint-Louis. The design is harmonious because it evolves incrementally, with volumes connecting to smaller blocks huddled around the two biggest blocks and connected to the buildings around them in the Forum district. 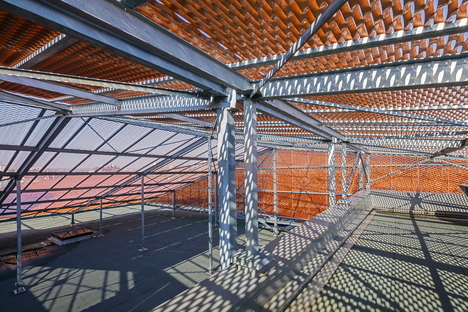 From the roof to the ground, the concrete structure with metal frames on the roof is covered completely with expanded metal plate, painted with a special copper pigments developed especially for the occasion, so that the building varies in colour with the angle of the light, from white to orange, passing through hues of pink and salmon. With wonderful grace, Gautrand translates a risky theme with a major impact on the land into a landmark, a visual and symbolic reference which belongs to the land and yet stands out from it as recognisable and charismatic.